Beauty Costs > How Much Does Ombre Hair Cost? Ombre hair became a phenomenon in the early 2000s when the popular celebrities, such as Aaliyah and Jennifer Hudson, had her hair dyed in a gradual fade from the roots to a lighter color near the tips. Originally, the hair gradually lightened from dark to light; however, it has expanded to other techniques. This trend, depending on the length of your hair, will create a “dipped” and lightened look. The cost of ombre hair will depend on the length of your hair, the amount of work that needs to be put in, the salon, the stylist you use and where you live. On average, ombre hair at a salon can cost anywhere from $60 to $150 for a partial application to $90 to $250 for a full application. A trendy salon in the heart of New York City could be closer to $250 or more, whereas a salon in the middle of a rural neighborhood could be much less. If you were to do it at home, the DIY approach will cost about $15 to $20 for the bottle, comb and directions. Most salons, from what we researched, would price in two ways: they would either charge it as a partial highlight or as a blending add-on, which would be another $30 to $50 on top of the average cut and washing fee. BehindtheChair.com listed a handful of answers from their Facebook fans in regards to this question, and according to most answers, the prices could range anywhere from $110 to $180 at most salons. The quotes mentioned above should include the cut, followed by the color placement to bring the “Ombre dye” look together. 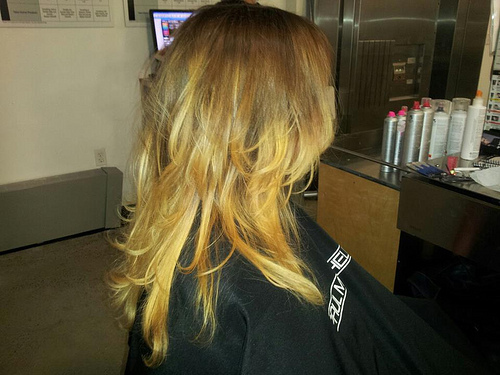 Ombre hair can come in a variety of different styles and colors. Basically, if you can think of a color and blend, it can be done. Popular color blends, for instance, can range from a dark chocolate look to a caramel coated color. Others prefer off the wall colors such as purple, red, blue, pink and grey. Most salons will first wash your hair to get rid of anything that could interfere with the coloring process. They will then apply the blended colors, let it set, and rinse it out. Your hair will then be dried and styled. Some salons will include the hair dye while others may charge you an additional fee for the colors. Generally, the darker the color is going to be, the higher the prices are going to be. As mentioned above, if the salon charges this as an “add-on,” then you will have to pay for the cut and wash if necessary. Don’t forget the tip. An average tip is usually 15 to 20 percent of the total. HelloBeautiful.com recommend choosing one to three colors to shade to create the ultimate “Ombre” effect. In the warmer months, they recommend a lighter and vibrant shade, whereas, in the winter months, it’s best to choose a cooler ash tone. To save money, try talking with a few salons over the phone or by visiting their websites. Some salons, for example, may offer packaged prices for having your hair colored at the same time. Most of the time, these salons will be more than happy to give a quote over the phone. Going to your local salon will almost always be less than going to a name-brand salon the local celebrities use. Anyone can do highlights; however, if you have never done it before, you may want to recruit a family member or friend to help you with the process. As noted above, most DIY kits can cost less than $20. Only lasted for a month. I charge 165 for my ombres because they usually require bleaching and toning. A good quality ombre requires a time consuming sectioning process as well so the hair fades gracefully in color and doesn’t look like you used box dye and grew it out. My clients usually request that their color begins about 3″ from the scalp, so no retouching is required for about 4-6 months. The amount of root color is, of course, a matter of personal taste. Some like more, some prefer less. The only clients that return sooner are those with gray hair. Then i simply retouch the root area with base color to cover the gray. I got my ombre done at char glo school of beauty in moses lake wa and it was soo amazing I thought it was gonna turn out to be a yellow brassy color but they got it just on point it was an ashy icey blonde color and It only took about 2 hours I highly recommend them great job!! !